MicroFluidics International Corporation, is a global leading manufacturer of Microfluidizer high shear fluid processors. MicroFluidics is also a leader in the design and production of laboratory and commercial processing equipment used in the production of micro and nano-scale materials for pharmaceutical, biotech, chemical and diverse industries. Microfluidizer technology enables some of the world's top companies to create superior products, develop intellectual property. improve process efficiency and capitalise on new revenue streams. All process equipment, solutions and support provided by MicroFluidics are optimized to meet the unique needs of each and every customer. 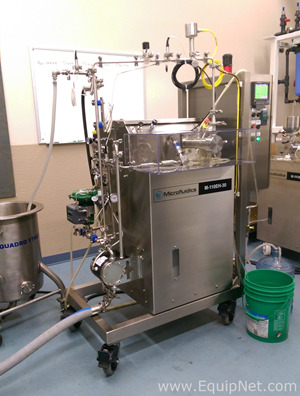 EquipNet is constantly receiving used MicroFluidics equipment through our exclusive contracts with our clients. Our inventory of used MicroFluidics equipment includes a 'Microfluidics M7125 20 Microfluidizer Processor With Control Panel', a 'Micro Fluidics Corporation M 610 100 Microfluidizer', a 'Microfluidics M-110EH 30 Microfluidizer High-Shear Fluid Processor', a 'Microfluidizer M110P-IICE High Pressure Homogenizer' and much more. If you don't see the used MicroFluidics equipment you are looking for, call one of our representatives and we'll find find it for you. We can also source the right tooling and change parts that you need through our huge network of corporate clients from around the globe.